Photo taken along Rackensack Wash, New River Mountains, Maricopa County, Arizona, June 2007. It is taking nectar at flowers of Dakota Mock Vervain (Glandularia pinnatifida). 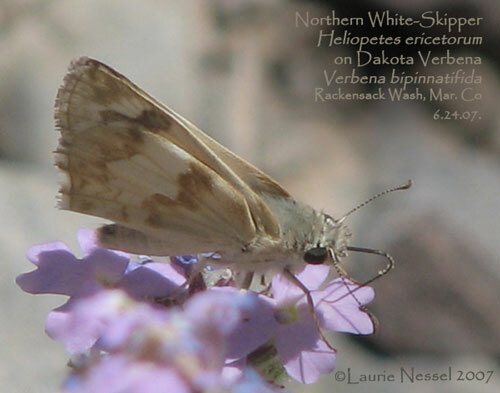 Of the largely white skippers in the Sonoran Desert, this is the less common one. It has a larger portion of white, particularly on the dorsal surface of the males. It can be found flying and taking nectar at flowers in Sonoran Desert canyons in late spring and again after the summer monsoons in September. The caterpillars can be found on various malvaceae.